I sometimes fry vegetables and chicken, crack a couple of eggs into the pan and stir it all for a while. Serve as is, or with fried rice or noodles. Does this dish have a common name? I have heard something similar to what you're describing called a "scramble". It's usually what I wind up with when I'm out of practice with making omelettes. I am quite sure it doesn't have a name in English. 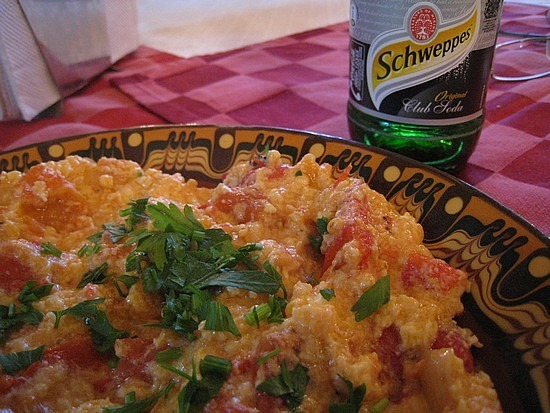 There is the traditional Bulgarian dish mish mash (миш маш), which is an example of what you describe. It never contains chicken, and the classic version prescribes that the vegetables have to be tomatoes and red peppers. But variations are possible, e.g. adding onions and/or feta cheese. It is always scrambled, never cooked to a single-piece omelette. No Bulgarian would even think of classifying it as a type of omelette. If a name for mish mash (or a more generic version of it) existed in English, I would expect to find 1) translations in dictionaries listing the English name and 2) mish-mash recipes intended for foreign audience which compare mish-mash to the existing English dish - for example, a recipe for kazanlushki ponichki would probably mention that they are very similar to donuts, but deep-fried. I looked around for such results. 1) wasn't so conclusive a search, because none of the sources I tried offered a translation for mish mash. While the reason could be that the word is too obscure to be listed, I see this as a circumstantial evidence that there is no easy translation. 2) delivered better results - none of the recipes in English I looked into mentioned a similar dish with a known English name. Some insisted that there are similar dish in the Mediterranean region, but did not name them. A20: It is type of omelette. I think that if there had been a better word than "a type of omelette", they would have used it. As a side note, try adding some (good quality!) feta cheese to your mish mash. It makes a very good combination. A 'Chinese-style' omelette of this nature is known as fu yung. This is usually a more coherent, one-piece omelette than scrambled eggs, however; perhaps 'scrambled fu yung' would work? I've always called it a western omelet. Typically red bell peppers and onions figure prominently. Sounds closer to a frittata, could also be called a scramble. An american omelet is fully cooked and has cheese and toppings in the center and is folded over. A french omelet is rolled so as to have layers. Scromlette, or "scrambled eggs with stuff in them." What is the egg mixture used in gratins called in English?